Chitra Ravi, Founder & CEO, EZ Vidya was conducting a training programme for CBSE School Principals. Unique to her style, she asked the participants to list the safety measures the leaders have taken in their respective schools. Fire extinguishers, SMS to parents, disaster team were few of the responses. Chitra then posed a question, “Have you ever considered the emotional safety of the child in the classroom?” and the principals drew a blank. At the fundamental level, EZ Vidya believes that quality education is much more than just the academic performance of students. Through our engagements with schools over a decade, it was evident that several critical aspects of true quality education were not in the mind space of many school leaders”, mentions Chitra. ‘Emotional Safety’ was just one example. To get a deeper understanding of this aspect, in 2012, EZ Vidya conducted a study among school leaders in 2,512 schools. While you might already be aware of some of the key findings of the study through the media, there was one other important takeaway for the organization. The need for ‘measuring’ quality education became evident. Putting together the insights from over a decade of field research and pedagogic research, EZ Vidya’s research and innovation (R&I) team finally cracked an innovative approach to measure the quality education in schools, the 5 Transformation Areas. The quality in the 5 Transformation Areas would indicate how engaging and effective the learning environment in the school is. Tracking the changes in these 5 Transformation Areas is the key to measuring the quality of education in a school. What are the 5 Transformation Areas through which quality education is measured? The aspect of a classroom where student thinking is valued, nurtured and challenged. This leads to enhanced thinking displayed by students, leading to better conceptual understanding. Focusing on dynamics, this aspect works around establishing cordial and learningoriented relationships between teachers and students, as well as among students themselves. Better relationships ensure emotional safety, leading to better cognitive performance. The yawning gap between the ‘digital native’ learner and the ‘digital immigrant’ teacher, makes it imperative to empower teachers. Empowered teachers facilitate better learning thereby taking charge of transforming classrooms to ‘thinkrooms’. The ambience in a classroom can simultaneously trigger thinking as well as reinforce learning. Apart from the learning aspect, a vibrant ambience also adds to the verve and enthusiasm among learners. This area focuses on the judicious and meaningful use of technology to make learning more effective, while also catering to the learner’s needs and engaging him/her more actively. For a teacher, technology provides the much needed tools to enhance his/her productivity. The transformation in these 5 areas in a school is measured through 28 parameters. For instance, ‘Student Participation’ is one of the parameters associated with the ‘Classroom Dynamics’ Transformation Area. An increase in the participation levels in classrooms shows more student involvement in the learning process and the increased confidence levels of students. 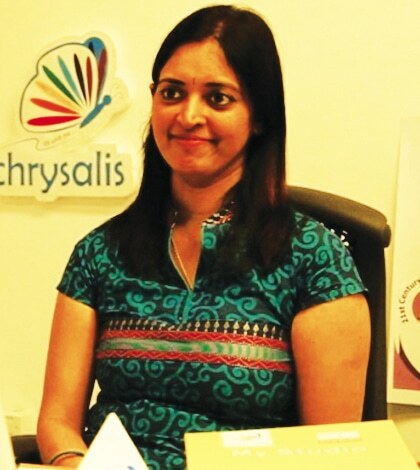 The Transformation Areas are integrated into EZ Vidya’s award-winning curriculum program, Chrysalis. Chitra remarks, “The real achievement for us is when the organization’s innovations are able to help bring a positive change in schools. Our clients are now able to track the school’s progress every quarter through the Chrysalis Transformation Report. Many Principals have found this to be additionally valuable as they are able to easily show this progress to their school’s stakeholders!” If you are a school leader, we encourage you to write in to vision@ezvidya. com with any questions on the Transformation Areas.